Bacchus knew what he was about when he linked wine and music together, and so do the wineries on the North Fork. 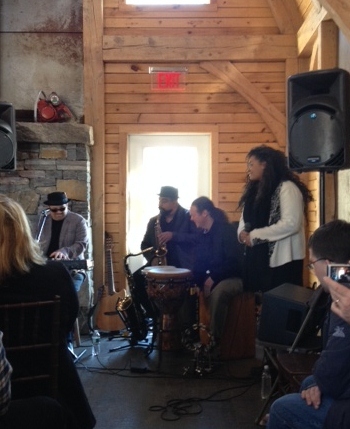 To chase away the winter doldrums—and what a winter we have had!—many of the wineries participate in the Long Island Winterfest activity called Live on the Vine, which brings musical performers to the tasting rooms. It used to be called Jazz on the Vine, but then the decision was made to open up to a more varied musical palette. 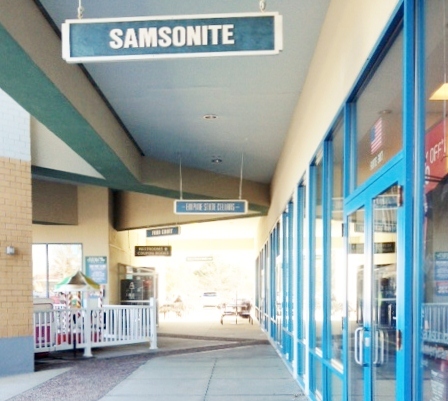 Most of the venues charge a fee of $20, which includes a full glass of wine. (After an hour we bought a second glass for $8.) We decided Sherwood House had the most convenient performance time and location, and checked my blog to decide which wine to get. The other piece of information we needed was whether or not we wanted to see the performer they were featuring. 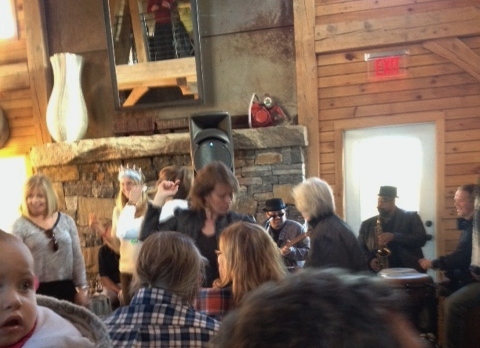 After much discussion and checking out of performers on-line, we decided to go to Sherwood House on Saturday for a performance by Jack’s Waterfall, and we were glad we did. On a web page, Jack describes his music as a combination of “Folk, Blues, Gospel and World Music,” and I’d say that’s about right. There was a lot of toe-tapping and head bobbing in the full-house audience, and even some dancing. Sherwood House used a second, barn-like building on their Main Road site for their music venue, leaving their tasting room free for those who wanted to do a tasting. 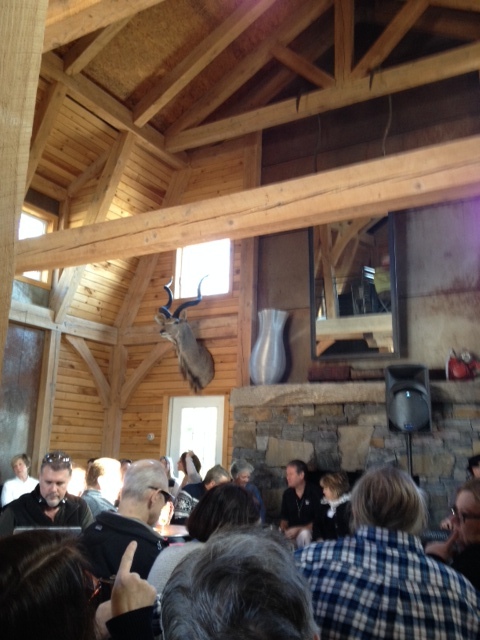 The room reminded me a bit of an Adirondack lodge, with its stone fireplace and animal head on the wall. An array of chairs and folding chairs formed a semi-circle around the band, so everyone could see and hear well. If you haven’t made it out East yet, you still have time, as Winterfest has been extended for an extra week in March. 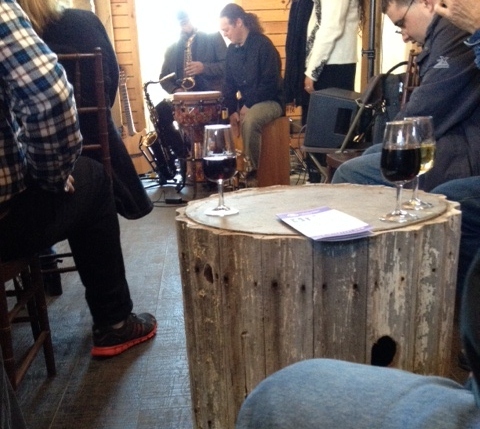 It is very pleasant to sit in a cozy winery, glass of wine in hand, and listen to music. I recommend you go! 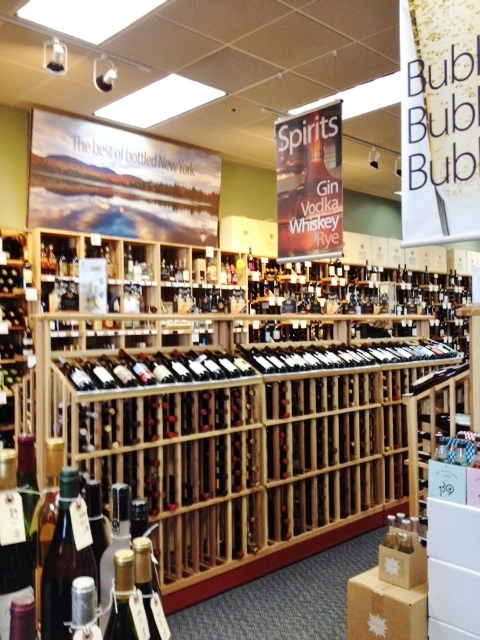 Look down the row to find Empire State Cellars. Here’s a great way to use my blog. 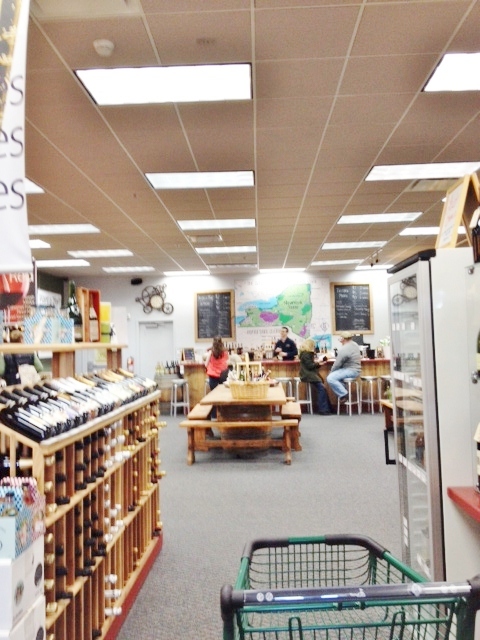 Tucked away in a corner of Tanger Outlet Mall in Riverhead, amidst stores selling luggage, lingerie, and not-quite-the-latest fashions, is a wonderful place, Empire State Cellars, selling wines, beers, liquors, and a few other products made in New York State. If you want a selection of local wines but you don’t feel like trekking from winery to winery to get it, this is the place. Even better, they offer a 10% discount on a case, and many of their prices are less expensive than in the wineries themselves. I know, I was surprised, too. The helpful clerks at the desk. 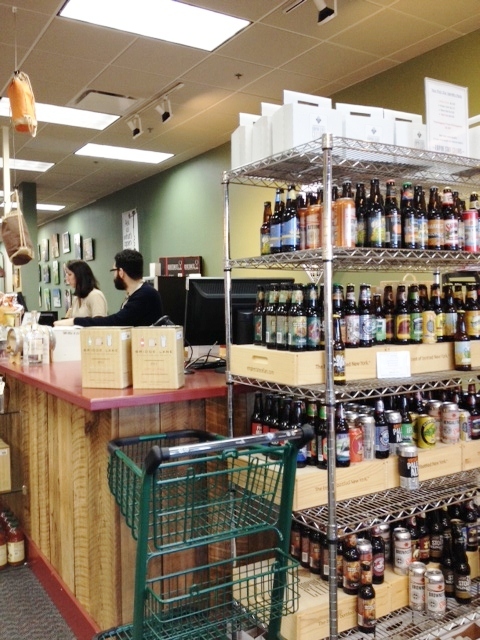 They also offer tastings at a bar in the back of the store. However, we didn’t have time to do a tasting that day, but we did need to decide which wines to get. As we scanned the shelves, I Googled Nofowineaux.wordpress.com/ whichever winery we were curious about. Up popped my blog, and then I just had to scroll down to see if I had reviewed that particular wine. Of course, since my phone “knows” me, all I had to put in was nofo, and it did the rest. You can also follow the same procedure in a restaurant to decide which wine to order, though sometimes, as we have found, wineries seem to bottle different versions of their wines for restaurants. Before I started my blog I was recording our tastings in a notebook, which was fine for deciding which winery to visit, but not a lot of help when we were out and about. Now I have this useful reference always with me—and so do you!